Any breakfast food with the word “sticky” in it just has to be good! 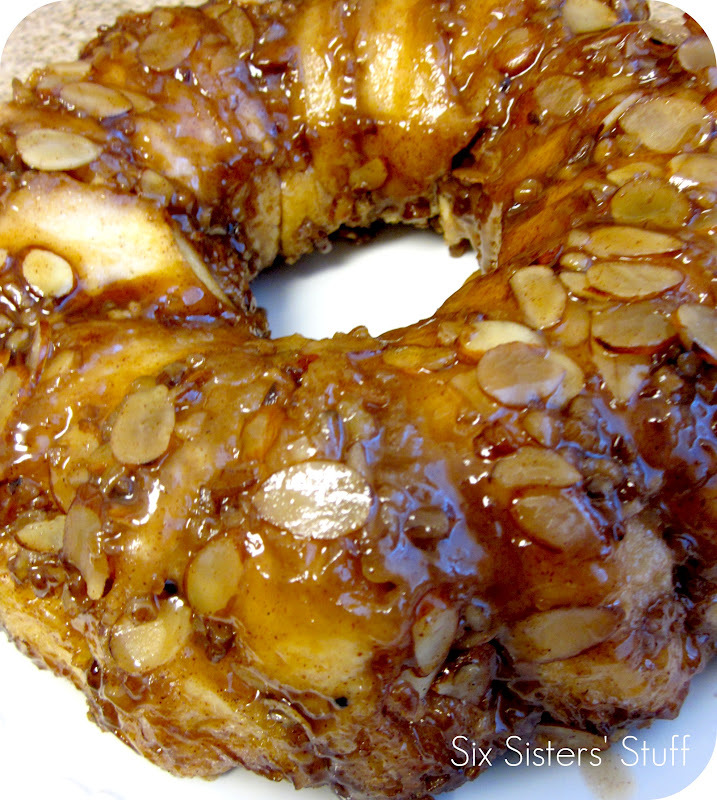 This is so simple to throw together and has the perfect amount of sticky, caramel goodness to it! An easy breakfast ring that can be ready in about 30 minutes. It's so easy to make! 1/4 c. chopped pecans, opt. 1/4 c. chopped almonds, opt. Spray a fluted pan with non-stick spray. Combine the melted butter and syrup in a small bowl and set aside. In another bowl, combine the brown sugar, cinnamon, and nuts (if desired). Place about half of the syrup mixture in the bottom of the pan. Then sprinkle half of the brown sugar mixture on top. Lay the biscuits on the bottom of the pan, overlapping edges (closely together) to form a ring. Top with remaining syrup and sugar mixtures. Bake at 375 degrees for approximately 25-30 minutes or until golden brown. Cool for 1 minute in the pan, then invert onto a serving platter and enjoy! Oh my goodness! Brown sugar, syrup, nuts, and cinnamon... I am in heaven! I know our readers would LOVE this! Bonnie and I would be thrilled if you linked it up to our Uncommonly yours party! Take care! This is exactly one of the dishes I made during Christmas--it got RAVE reviews. It's a keeper for sure. IF you can possibly toast the nuts lightly before begging, even if it's while the oven heats up--you'llo be glad for that extra toasty touch. Saw this on Pinterest awhile back and made it for Christmas. Delicious! Yum! Just found your blog and I just can't seem to get enough of it! This looks great and cute! WOW this looks great! I love something sweet for breakfast!! Thanks for sharing at oopsey daisy! Thanks for posting a link to my blog. I'm so glad to hear you liked these! I've recently tried and blogged about your Better Than Everything Brownies. LOVE those!! have been trying to find this recipe. made it once and needed it for company. this was easy and very yummy.